When I would hear my mother say I needed “to boost my immune system” I would imagine combat ready cells flooding my body to attack the bad stuff. I figured these fighters must be activated by orange juice because she always had a glass in hand when my immune system was being discussed; and, something to do with Vitamin C since that is what she said would do the trick. Beyond that I didn’t think deeply about what exactly my immune system was and how it worked. Somehow, despite a science heavy undergrad as an adult I still never really understood much better than my childhood imaginations. Much later in life I was stunned to learn how between 70-80 percent of our immune system resides in our gut. I was fascinated about just how important the balance of bacteria is in regulating everything from insulin sensitivity to inflammation (think arthritis, aging, and a whole host of ills), to mitochondrial function. Sadly it is pretty easy to get this bacteria out of whack. Most of us know how antibiotics can wreck havoc on our gut health; but, even chronic stress can reduce the “good” bacteria to unhealthy levels. Maybe your life is different than mine; but, for me “chronic stress” is par for the course!! So, I decided getting my and my families guts in good health would be useful. . especially with the flu season around the corner. One great option was the obvious probiotic. But finding one that is the strain of bacteria you individually need, in the right amount, and that is even truly alive was not an objective with guaranteed results. Probiotics aren’t regulated, variety of strands can be numerous, and its not exactly clear how many millions you need to get the “right dose.” I concluded that the best way to get a wide variety of bacteria with enough guaranteed “live” to make a difference was to increase fermented foods in our diet in conjunction with a daily probiotic. Enter “the pickle challenge.” I planted four pickling cucumber plants and let the games begin. My friends/family were the taste testers of multiple attempts to formulate the best dill pickle recipe and “Sabrina’s Dill Pickle Recipe #5” was the clear winner. At least that’s what they said and I am hoping they weren’t just tired of pickles.. .lol! I am happy to share the results with you and see if you love them as well. Stay tuned. . .my Bread and Butter Pickle recipe will be posted soon as well as my Sauerkraut recipe to further keep those guts strong. Enjoy! Two really big stock pots. One to hold 9 quart jars and enough water to cover by a couple inches and one to prepare the brine. 1 cup canning salt– canning salt is great because it is very fine and dissolves easier. Regular table salt also has an anti-caking agent that makes the brine cloudy and iodine which can darken your pickles–neither of which is in canning salt. However, kosher salt and pure sea salt can also be used. 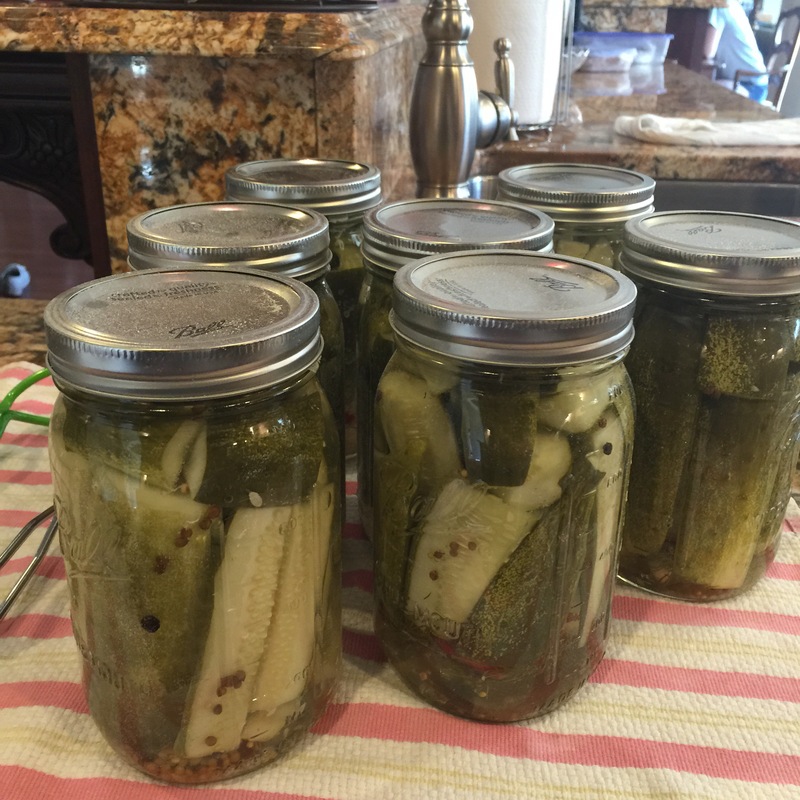 12 pounds pickling cucumbers– You want to make sure you have pickling cucumbers and not slicing cucumbers for this recipe. Pickling cukes are usually smaller–around 5-6 inches–and they will be spiny not smooth. Ideally they would be canned within 24-48 hours from picking. If you aren’t growing them try to get them from a farmers market that uses organic practices and prepare as soon as possible to maximize freshness, flavor, and nutrients. Don’t use any cucumbers that have significant blotches or that are soft. If the cucumbers are already going South they won’t freshen up by pickling them. Fill the stock pot you intend to use for your water bath with water on high heat to get it boiling while you work. If you cover it– it will boil faster. I learned the hard way to not forget this because the water bath takes a LONG time to get ready and you don’t want to be all ready to process and twiddling your thumbs while you wait… lol! You can also at this time warm your lids if desired. This is no longer required but I still do it just because I think it helps make a better seal. Never boil the lids only warm. Cut off both ends of the cucumbers (this prevents enzymes that are still in the blossom end from messing up the pickles). Then quarter them lengthwise to make spears. In a stockpot, bring water, vinegar, the bay leaves, and salt to a boil. Boil 10 minutes. Keep the brine hot on a low simmer while doing the next step. Place one half of a dill head, a garlic clove and two peppercorns in the bottom of each of the nine HOT jars. (You can run them in the dishwasher and leave them in there hot until needed or just put them in the boiling water as you work. You want them hot so the glass doesn’t break when the brine is added). As tightly as you can- pack one layer of spears into the jar. Then add the rest of the dill, another garlic clove, 2-3 more peppercorns, 1/4 teaspoon mustard seed and 1/8 teaspoon coriander seed. (I do this simply to improve the appearance of the finished jars. It’s pretty to see all the spices throughout the jar. I also think it makes it more likely to thoroughly season all the cucumbers evenly. However, if you want to put all the seasonings in the bottom then pack it should work fine.) Finish packing cucumbers into until they are 1/2 inch from the top. There won’t be enough room to finish this packing with your full spears. You will need to cut them into quarters to make them fit. If needed add more brine to get to the 1/2 inch of headspace. Wipe the rims and threads with a wet paper towel. This is very important because if there is any brine on the rims a seal will not form properly. Center lids on jars and screw on the bands fingertip tight. Don’t barely tighten and don’t screw them on with all your strength either. Its firm but not where they take much effort to remove. Using the jar lifter, lower the jars into the boiling water bath for 15 minutes if you live in Leesburg, VA. If you live in an altitude between 1-3,000 feet add 5 minutes. Between 3-6,000 feet add 10. Between 6-8,000 feet add15 minutes and between 8-10,000 feet add 20. Once the timer beeps carefully use the lifter to remove jars and let them cool. Let them sit for 12-24 hours before moving them to the pantry. You will soon hear the telltale “pops” that evidence a seal well made. Give them at least two weeks for all the flavors to meld and the fermentation to take place. Label your jars with what they are and the date they were processed. If the seal is formed (evidenced by the “pop” and that there is no “give” when the lid is pressed on in the center) they should last for years. However, after a year you might notice some loss of flavor/appearance. When ready serve with hamburgers, hotdogs, sandwiches, or just enjoy on their own! Delicious and supporting a healthy immune system! !